“Music at Kohl Mansion” rang in the New Year with a gala concert on Sunday, January 3, celebrating with the FOG Trio. This Burlingame music series is held at the impressive Kohl Mansion, built in 1914 by the scion of a shipping magnate and willed by his mistress to a convent. Now a religious college preparatory school for girls (Mercy High School), the ornate Great Hall is also the site of a long-running chamber music series. The FOG trio is violinist Jorja Fleezanis, pianist Garrick Ohlsson and cellist Michael Grebanier. While each has had separate active careers, they have performed together for the last 15 years. Fleezanis was associate concertmaster at the SF Symphony before becoming concertmaster of the Minnesota Orchestra, and has performed with the Music@Menlo summer festival. Grebanier is principal cellist of the SF Symphony, and Ohlsson has appeared with the SF Symphony, the NY Philharmonic, and a host of others. Fleezanis dedicated the night to the memory of her husband, Michael Steinberg, an extraordinary musicologist who passed away last summer. He popularized classical music through wit and a knack for immersing his readers in his own love. I once heard him lecture on Romanticism and will miss his insight and humor. They opened with a late Joseph Haydn work, his Trio in E-Major, which begins to develop Romantic gestures. This equable and prolific composer, who became synonymous with a string quartet’s gentle discourse and a return to the ideals of classical Greece, late in life explored a more heated vision, the E-Major Trio among them. Haydn’s earlier continuo work was for harpsichord, but here he cultivated the dynamic possibilities of the newly invented pianoforte. While still using strings to extend the piano—violin embroidered the right hand and cello the left—each instrument began to carry its own voice, with rhapsodic runs in the violin part. Their overlapping voices created finer textures—in the first movement string pizzicatos embellished soft piano notes to reveal one softly belling instrument, plucked and struck. Then they slowly climbed a chromatic minor scale in the brooding middle movement, recalling a churchly Dies Irae with modern bite. That eerie movement relaxed to bonhomie in the Finale, lighter and flowing, then bloomed into stirrings of Romanticism under a violin’s lush bowing. Grebanier joined the duo for Robert Schumann’s Piano Trio No. 1 in D minor, Op. 63, a work of passion and mood-swings. Fleezanis owned the lower register, elbowing the cello off its home turf, but it often peeked out on the higher strings. They found their balance in the soulful Adagio, trading secrets as Ohlsson pedaled heavily to create rumbling undercurrents. In the final movement their storm-tossed runs turned to hopeful major as they rowed for port. Steinberg would have been in heaven. 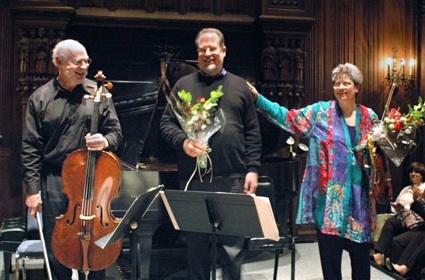 Photo of the FOG trio: from left, Michael Grebanier, Garrick Ohlsson and Jorja Fleezanis.